Xanthe and Piper are by Lassiter's Lake wearing party hats. XANTHE: ...cos she can now buy beer! PIPER: Hey, y'all! So yeah, I'm eighteen! I can't believe the day has *finally* come. XANTHE: Woo! How do you feel? XANTHE: OK, well, what about you and Tyler? I mean, with everything that happened at the start of the year, you were so excited to turn eighteen. PIPER: I was *aching* for it. But I was under the impression that if I was, like, eighteen, our relationship would be legitimate, people would take us seriously, but like, that's happened without me being eighteen. XANTHE: OK, well, maybe when your exams are done you'll be more excited! Just then, a party poper explodes over Piper. A slow motion replay of the incident ensues. Xanthe can't stop laughing and Piper joins in. XANTHE: OK, that's the last one I'm popping! PIPER: I can't even remember what the question was! What did you ask me? They are both laughing hysterically. XANTHE: Once exams are over, then you'll be more excited. 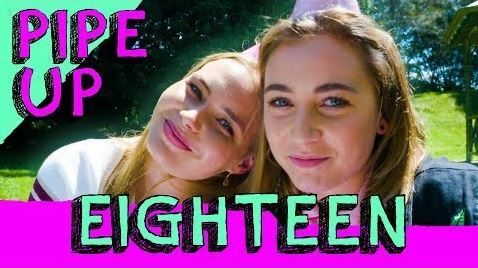 PIPER: People put so much emphasis on turning eighteen. I can vote now, I'm suddenly seen as, like, mature, like yesterday I wasn't mature or responsible enough to make that adult decision. Today, one day later, I *am*. XANTHE: OK, but you're the type of person that was mature enough to vote at the age of, like, seven! PIPER: It's ridiculous, if you think about it. Like, if you're 364 days old, no. No, no, you can't, you're not an adult, you're not, you can't buy alcohol. But *one day later* I can buy as much as I want! XANTHE: It's OK, that's the thing that I wanted to say. XANTHE: Every best friend's dream. XANTHE: Basically, I got Piper a session in an isolation tank. PIPER: A sensory deprivation tank. PIPER: Oh my God, Xanthe's dreams are the *best*. Go, tell one! XANTHE: Truly floating in a blue planet right now. Space, there's just so much world out there, and who knows, we are in a dome. We are *literally living in a dome, and all of our little problems, like, they don't matter. PIPER: I don't want to be having an existential crisis in the tank and being like, "Am I dead?" I don't know, because I can't feel anything! XANTHE: Or you'll be floating, like you're floating in space. PIPER: Can you drown? But isn't it in water? What happens if you fall asleep and you roll over? She pops another party popper. XANTHE: Just keep them coming! PIPER: Don't, I'm like, *so* on edge! I have a question. PIPER: Speaking of not being able to feel anything...if you had to live without a sense, what would you live without? She looks back at Xanthe. PIPER: Can you imagine going in...think of all the flavours of yoghurt, all the toppings...of all the combinations and not being able to taste that. PIPER: Oh, you *have* to have sight. She holds up the party popper shell. XANTHE: I guess...it would be...touch. PIPER: That's sad, though. I mean, think about it...like, you wouldn't be able to feel a hug. XANTHE: And I'd be like, 'I didn't even feel this, guys!" PIPER: Yep, I'm going to lock in touch as well. XANTHE: Oh, lock it in! PIPER: Lock it in, Eddie! Xanthe innocently lets off another party popper. They smell the empty shell of the party popper. XANTHE: See, I love this smell, though. PIPER: It's such a good...bonfires. XANTHE: It just smells like childhood. XANTHE: Oh, my gosh! Like the smell of coffee. XANTHE: You don't like the smell of petrol? PIPER: I need you to help me with something...could you hold the camera because I need both hands. She takes out a piece of paper. PIPER: Here's something I prepared earlier. Not that much earlier, because I didn't know this was happening. We're going to do a little game. I've written down some questions and I'm going to answer them, and then I'm going to ask them again when I'm, like, thirty, and compare the answers and be like, wow, I've really grown, or like, wow, I haven't. XANTHE:(reading off the sheet). What's the most important quality you think you have? XANTHE: Oooh! What sort of passionate are we talking about? PIPER: You saucy little minx! No, in all aspects of my life, I am passionate about...justice. I am passionate about...HD Cameras. XANTHE: What's a quality you have that other people wish you didn't? XANTHE: Mmm, does Tyler agree with that? XANTHE:(imitating Tyler) Oh, Piper, I *love* how passionate you are, I don't even know how to *spell* the word 'patriarchy'! PIPER: Savage, but true! Question 3. XANTHE: Awwww. How much do I love Xanthe? PIPER: Yes. Now, this one's important, so I want you to remember this one and archive. Words cannot explain the love that I have for my beautiful, dear friend Xanthe. You know, when I'm thirty, I hope that you will be there. I don't know what the future's going to hold for me, but, I know for sure that I want to be surrounded by people that I love. PIPER: I miss that. I miss that person, you know? Xanthe is touched. But suddenly Piper lets off a party popper and she screams! A slow- motion replay ensues. PIPER: I just have to get you one more time to be even! Yeah, you know what, today, I challenge you guys to tell someone how much they mean to you. We don't do that enough. 'Hey, I love and appreciate you!' (To Xanthe) I love and appreciate you! XANTHE: I love and appreciate you, man! PIPER: Stop it! That's all, guys. Thank you so much for watching! Like, subscribe, blah, blah, blah. Bye guys!